How to use the Zest-it Acrylic Brush Cleaner to revive your brushes. stiff with Acrylic paint back to life - the brush saver! The Acrylic Brush Cleaner is a much safer solvent for use in the studio, it is easy to use with a slight orange/citrus smell, it is water soluble, non-flammable, non-toxic and contains no Aromatics or CFC's, has low VOC's and is kinder to the environment. It is re-usable, which makes it economical and a little goes a long way. The citrus oil element helps to stop the hair/bristles from becoming brittle and dry, so your brushes last longer. 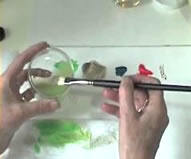 It will remove old dried Acrylic paint from brushes that would normally only be good for throwing in the bin. Brushes 'crusted' with dried Acrylic from constant use can now be brought back to supple usefulness! Decant a small amount of Acrylic Brush Cleaner into a separate container, only deep enough to cover the hair/filaments of the brush, swirl the brush head in the liquid gently, wipe onto kitchen towel. Repeat, wipe the brush head between folded kitchen towel to remove softened Acrylic. Repeat, as the Acrylic softens then the brush can be pressed against the side of the container to help release the product. Repeat until all the Acrylic paint has been removed. Different products take different lengths of time for removal, if you wish to 'soak' the brush in the fluid then about 5 minute would be a good starting point. Wash the brush and your hands with soap and water. Label and store the container containing the used Zest-it for re-use. It will also remove Acrylic based products from hard surfaces (wipe the handle of your brush!) and from paper and canvas. If used in this way, wipe the cleaned surface with a water damp cloth. 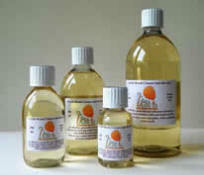 Sizes; 50 ml; 125 ml; 250; 500ml and 1 Litre.